A thermodynamically consistent phase field approach for fracture including surface stresses is presented. The surface stresses which are distributed inside a finite width layer at the crack surface are introduced as a result of employing some geometrical nonlinearities, i.e., by defining energy terms per unit volume at the current time and evaluating gradient of the order parameter in the current configuration. 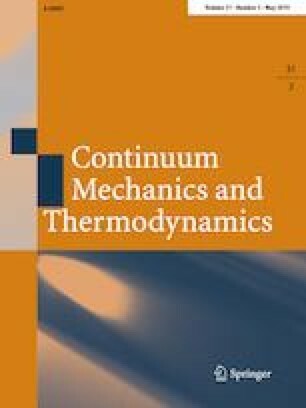 A double-well barrier term is included in the structure of the Helmholtz free energy which allows one to use the energy terms per unit volume at the current time when introducing the surface stresses in the current approach. Thus, the surface stresses are introduced in a similar way to the interfacial stresses in phase transformations. The differences in the modeling of crack growth with considering the surface stresses and without it are discussed. It is shown how the surface stresses affect the stress fields and consequently the crack nucleation and propagation. The finite element method is utilized to solve the coupled equations of mechanics and crack phase field. It is emphasized that the surface stresses affect the driving force for both the crack nucleation and propagation by disturbing the momentum balance. Thus, a different external loading is required in the presence of the surface stresses.